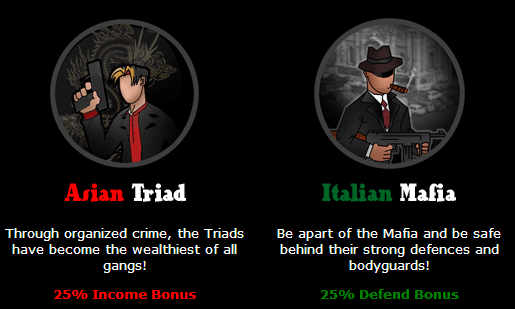 In Crime Nation, you are in command of a gang of either the Asian Triads, Hatian Thugs, Hispanic Crew or Italian Mafia. The aim of the game is to achieve the highest overall ranking - worked out by taking a combination of your attack, defence, and covert (spy) rankings - whoever has the best combined ranking will be 1st in the overall rankings. 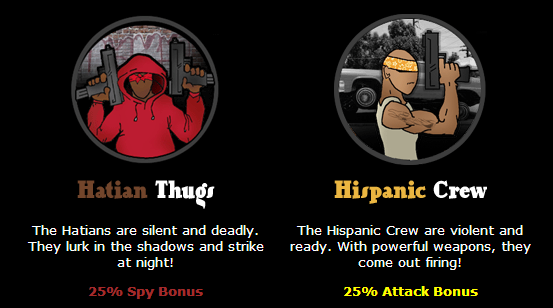 This makes it important to keep your gang evenly balanced in all these areas.